Chrome Web Store Passes 30 Million Users, But How Bright Is The Future? On September 1st, Google’s popular browser, Chrome, celebrated its third birthday. In a relatively short span of time, Chrome has gobbled up 22 percent market share among browsers, compared to Firefox at 28 percent and IE at 42 percent. The browser continues to iterate, now working in rapid-fire six-week release cycles, and its ecosystem at large has taken some big strides forward over the last year. For me, personally, I use multiple browsers daily, but Chrome has really become my go-to. However, Chris Sorensen, Founder of ChromeOSApps.org, an independent website that monitors CWS app performance data, shared some stats with us today that give us a look at the Web Store’s growth since it launched, and the numbers are not quite at a “trickle”, as they were early on. For a bit of context, on January 13 (after about a month of being open for business), the Chrome Web Store had debuted 2,195 apps, and had attracted 4.5 million aggregate users, according to Sorensen’s numbers. 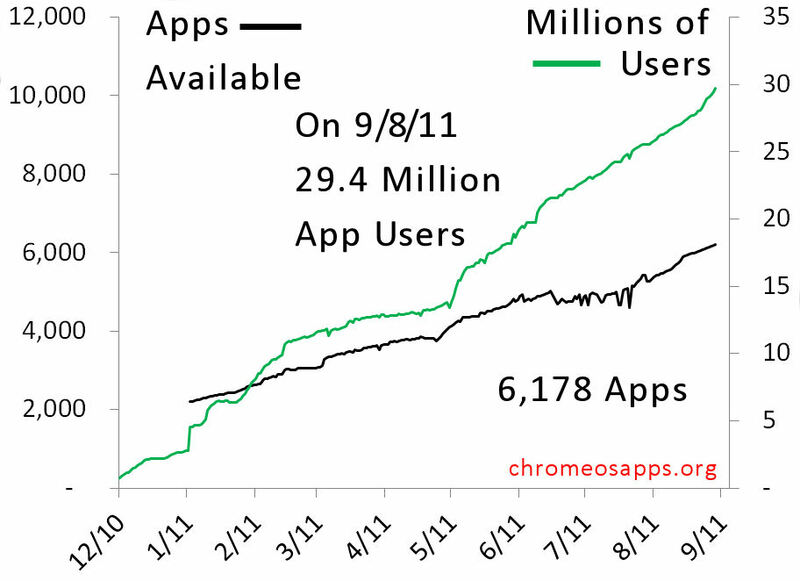 By September 1st, CWS had grown to over 6,000 apps with nearly 28 million aggregate users. On September 9th, CWS has passed 30 million, according to the numbers we’ve seen. As for downloads: The Chrome Web Store only started keeping track of downloads on May 15th, but the latest data from Sorensen indicates that CWS is attracting over 2.5 million weekly downloads. As seen in the graph below, Google’s Web Store experienced a significant uptick in the number of apps and (more significantly) the number of aggregate users beginning in about June. The likelihood is that the increase the store is seeing to date is a result of early presale of Google’s Chromebooks, which don’t allow users to download native applications. But what about sales? In January of this year, 2.8 percent of the app store’s total users were using paid apps. By September 1st, 2.1 percent of the 30 million users are using apps with a pricing “other than free”, Sorensen said. As per total apps, in June, 9.1 percent of CWS’ apps had pricing other than free, while on September 1st, that number was down to 5.7 percent. This shows that paid app usage on CWS have been, overall, decreasing since its launch — as has the number of paid apps (at least since June) — while usage and number of free apps has increased more significantly. Especially those bookmark apps and free extensions, which have gone like hotcakes. While CWS’ numbers are looking more auspicious than they did 6 months ago, the problem for the web store is that it is still hampered by the fact that developer activity just isn’t growing at the same rate as it is on the Android Marketplace or Apple’s app store. Google has some great incentive for developers to offer paid apps, offering 70 percent revenue share to developers for paid app pricing, and 95 percent revenue share for in-app purchases. That’s plenty of incentive for developers to create paid apps, but users just don’t seem to be buying. Compared to Apple, which will be generating $2.86 billion in app revenue and Android stores which will be pulling in $1.5 billion by 2016, according to Ovum’s research (though total revenue generated by the web store is not known), it seems pretty clear that CWS has a ways to go. Not to mention, there’s the threat of Facebook’s Project Spartan, the social network’s secret coup to break up the Google/Apple lovefest reigning supreme over the native mobile apps world. For those unfamiliar, Project Spartan is the HTML5-driven mobile application platform Facebook is supposedly building with a group of third-party app developers — and its initial target is Safari, not Chrome. If Chromebook sales really take off (and as the hardware stands right now, that’s far from a given), the web app store’s progress may well benefit as a result, as Sorensen tells me he predicts a serious rise in the demand for deep, full-featured enterprise desktop apps — but that remains to be seen. Google may also have plans to merge Android and Chrome, but there are a lot of unanswered questions in terms of how the company envisions the future of its web and mobile platforms. For now, Google will have to take solace in its uptick of free users, regardless of the correlation, but danger certainly looms.